Termites can wreak havoc on the structural integrity of your property and drastically reduce the property value. If you suspect a termite issue in Sacramento or the nearby areas, get in touch! Termites are one of the last pests you want to find in your home. By the time you know that they’re there, they have likely caused severe damage to the wooden elements of your home. Termites are notoriously difficult to detect, and while we list some signs of a termite infestation below, it is best to have regular termite inspections performed. A termite inspection is the best (and often, only) way to detect termite problems before they get out of hand. There are several species of termites in California and each one requires its own special treatment. The professionals at Earthwise can identify what type of termites you are dealing with and devise a plan to fix the problem. Every year, termites cause more damage than hurricanes or fires in the U.S. combined, and it’s just a matter of time before they start munching on the structural features of your home or commercial building. The truth is that termite infestations often go unnoticed for years or even decades. If you haven’t had a termite inspection in the last few years, we would highly suggest scheduling a session with a Sacramento termite inspector. 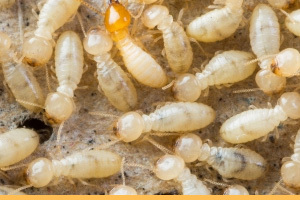 Whether you live in Carmichael, Folsom, Roseville, or the greater Sacramento area in general, we here at Earthwise Pest Management want you to be as informed as possible when it comes to termite behavior. Termites in California can cause serious damage to structures both residential and commercial, so if you have an immediate Sacramento termite control need, don’t hesitate to reach out to us for a free quote and a deeper explanation of our green pest control services in Sacramento. Whether you are in need of residential or commercial pest control, we have the experience, dedication, and affordable pricing that our clients have come to know and love. Every year, termites cause more damage than hurricanes or fires in the U.S. combined, and it’s just a matter of time before they start munching on your home or business. While many don’t understand the ill-effects termites can have until it’s too late, consider this mind-blowing statistic: termites cause $5 billion in damage in the United States of America alone. If you reside in a potentially at-risk area, it is clear that proper precautions must be made. Not only are they destructive pests, but they multiply quickly too. Termites can be difficult to detect as well, increasing the need for regular inspections by a Sacramento termite control specialist. They may be living in your home for some time before you realize it, so it’s more important than ever to get termite inspection performed on your home or commercial building to be sure they are NOT there! If, however, you consider yourself more the self-sufficient type, this termite services and info page is for you. In it, you will find general information about common types of termites in Sacramento and the surrounding areas, a description of their behavior, termite prevention and exclusion techniques, and where we come in at Earthwise Pest Management, the top providers of pest control in Sacramento! Keep in mind you can find out more information about pests aside from termites right here in our page covering Pest Info! What Termites Are Found In California? There are three primary kinds of termites found in California – the Drywood termite, the Dampwood Termite, and the Subterranean Termite. And although each exhibit different behavioral patterns from the next, all three are capable of infesting homes or other structures resulting in the need for a termite exterminator in Sacramento. Characterized as an invasive termite species, Formosan termites are a variety of subterranean termites that have wreaked havoc across the United States for the last century or so. Having emigrated, as it were, from East Asia around the turn of the 19th century, they’ve become so widespread that they’ve impacted many parts of the world in addition to the nigh-on-entirety of the U.S. Western subterranean termites are more common to the Pacific and western states of the country, including Washington, California, Nevada, Idaho, British Columbia of Canada, and even into western Mexico. In Northern California alone, the Western subterranean termite poses a massive threat to timber and its economy, costing the region millions in annual damage. It is estimated that one in every five Northern California homes within urban areas will be attacked or have been attacked at some point by these pests. That is why many people need to conscript the Sacramento termite services we provide here at Earthwise Pest Management. We provide termite inspection, termite treatment, and even termite prevention services to secure your home or place of business. And while we are Sacramento termite control professionals, it is impossible to completely fortify your home from the threat of these subterranean termites. That said, homeowners in the Sacramento and Northern California area need to be equipped with the basic knowledge to identify signs of these pests to limit the cost of termite damage if an infestation is found. Let’s start with the tell-tale signs of a termite infestation – timber damage. Western subterranean termites are especially dangerous to douglas fir and other building timber used in home and building construction in Northern California. That’s not the kind of fact you like to hear as a Sacramento or Carmichael resident — we know — but it remains the state of things. Swarms of these Formosan termites will attack and devour the internal spring wood sections of trees, leaving the external summer wood intact. This results, as you may have guessed, in timber failing to be identified as infested due to the external appearance (really just a shell at this point) remaining intact while the insides of the timber are packed with moist soil. Once you cut into the wood, you are able to see this “honeycomb” effect. Although the entirety of their existence occurs underground, termites are interestingly social creatures. Their massive underground nests are comprised of a termite queen, king, not-yet-actualized kings or queens (“winged reproductives” or “alates”, to be precise), soldiers, and worker termites. Aside from being a participant in breeding, the king does little else aside from being attended to by the worker termites within the central chamber of a given hive. Queens do most of the reproductive heavy lifting, as it were, in that she lays an impressive number of eggs. Her body is vastly larger than those of her mates or subjects, and she can live longer than 25 years. 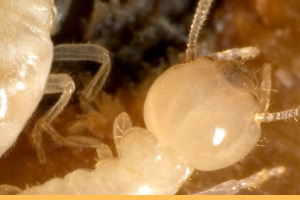 Considering the fact that queens can produce 2,000 eggs a day, and you begin to see how vital it is to address a termite problem head-on with a professional termite control specialist in Sacramento (like us, here at Earthwise Pest Management). Worker termites are quite small in size – about half the size of a match head, or ⅛ of an inch in length. They have no wings, are sterile, soft-bodied, blind, and work 24 hours a day once they become an adult. While their work ethic is impressive, it’s less than ideal when they have your home or place of business as their next target. You are unlikely to see this class of termites in your home, as they are experts at staying discreet. Soldier termites are orange colored with rectangular-shaped heads. They also sport pinchers which are used to fight off enemies like ants. They have a front-gland hole which they utilize to spray a sticky, latex-like material onto said enemies in order trap and immobilize them. Termites have been at odds with ants for some 250 million years, and the soldier termites have developed a specialized defense against them, as can be observed by the pinchers and debilitating spray. Homeowners occasionally spot a Sacramento termite infestation when termites and ants take to the battlefield. 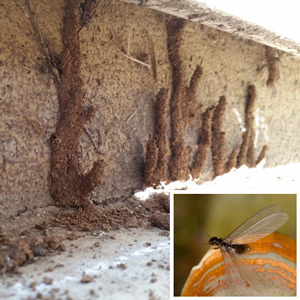 Winged reproductives, also called swarmers or alates, are some of the most commonly observed termites in California, as they are known to “swarm” in the daytime during the spring. They don’t have the best vision and they aren’t the most skilled of fliers, but their key to survival and reproduction lies in the fact that they can be lifted up and taken by the wind for hundreds of yards. Once they land, they’ll establish a new colony. This is significant because it suggests that homeowners who do not live near a wooded area are still potentially vulnerable to the Western subterranean termite. “Swarming” (or spreading) usually takes place in the spring, although some smaller swarms might take place later on in the summer months. If you find signs of swarming around your home, give us a call for immediate Sacramento termite treatment. We are a pest control company in Sacramento that can both control and prevent termites from infesting your abode. 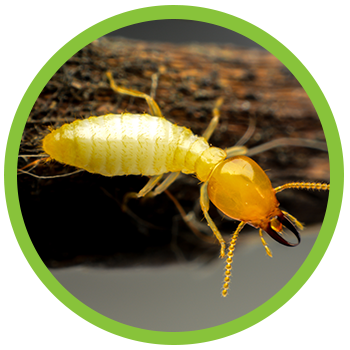 While it is important to remember that Formosan termites need moisture to survive, Drywood termites don’t. And although they are predominantly found on the coasts of this region, these Western drywoods can be transported into your home via infested furniture or, really, any kind of wood taken into your home. These kinds of termites, while not as common as their subterranean counterparts, can be even more destructive to structures. If you have recently brought any wooden items into your home, or even if you have recently purchased an older home, make sure to schedule a termite inspection in Sacramento. Western drywood termites are more likely to be found in poorly-constructed buildings made entirely of wood. If you are wondering what characterizes a poorly-constructed building, just take a look at the corner joints. They have to be flush, otherwise these termites will enter through the ends of the wood. Very rarely will Drywood termites enter through the sides of wood. With that knowledge in mind, it becomes clear how important having a well-made wooden structure (like a home) actually is. If you are in the unfortunate position of discovering your corner joints are vulnerable, we recommend getting those fixed in addition to utilizing our termite prevention and exclusion program. As part of our Sacramento termite inspection services, we’ll analyze all at-risk areas of your property and give you a thorough breakdown as to what you need to address to be sufficiently secure. Of course, if you already have a termite infestation, we will address that problem head-on with our Sacramento termite management services. Other evidence of Western drywood termite damage includes the transformation of the wood that they’ve delved into. These pests tend to eat across the wood grain, creating galleries that are connected by tunnels. These tunnels and galleries are remarkably smooth, containing no sediment at all, as opposed to their messier subterranean cousins. Be sure to eliminate all areas of standing water in your home (this goes for all pests). Likewise, make sure you eliminate any unused timber in your yard. If you need to store firewood outside, make sure you do so a minimum of 20 feet away from your house and five inches off the ground. Be proactive about replacing broken or damaged roof shingles and weather stripping. Consider making compost out of your landscaping trimmings. If you break it down, termites won’t be able to infest the wood. You could also contact your local municipality to ask about wood recycling options in your area to be proactive about termite control. As we alluded to above, termites won’t be able to get into your home if wood isn’t coming into direct contact with the ground. Consider placing a concrete base on wooden items around your house. Yes, this is a more involved preventative measure, but it certainly beats having to deal with a rotted home. You can also eliminate termite access by filling in the cracks around your house. Once you fill in the areas, be sure to treat the specific area with termiticide as a preventative measure. Of course, we can handle all parts of termite control for you, should you wish. Keep your basement, attics, and crawl spaces dry and well ventilated. Inspect your home for internal cracks and, if found, be sure to seal them up as well. Inspect any wooden furniture or picture frames you bring into your home. Examine the wood for small holes or material that looks like sawdust at first glance. This isn’t actually sawdust, for the record, but is called “frass”, which is a kind of excrement produced by termites. You can use a pin to probe the small holes to find an exit hole the termites are using. Call your local termite exterminators at Earthwise Pest Management. 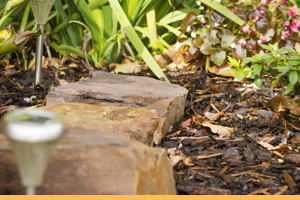 We use environmentally-friendly, safe, effective termite control Sacramento residents can depend on. Plus, it won’t cost you an arm and a leg, either! Give us a call for any and all of your termite issues. We are known as one of the top Sacramento pest control companies for good reason. Get your free quote today! Be sure you ask us about our Quarterly Pest Control Services we offer here in Carmichael, Folsom, Roseville, and greater Sacramento. 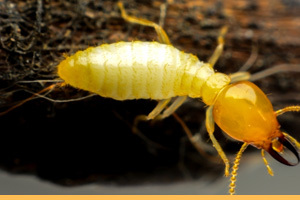 CALL TODAY FOR EXPERT TERMITE CONTROL SERVICES IN SACRAMENTO, FOLSOM, AND ROSEVILLE!